Cavachons, Dorkies, Yorkipoos, Buggles, Goldendoodles, Cockapoos, Bowzers, Porkies, Baskimos, Puggles. They are all mutts… Really really really expensive mutts. By slapping the “designer dog” label on them, unscrupulous dog breeders and puppy mills are able to sell them at outrageous prices so the consumer feels like they are getting something “special” and “new”. When really, they are getting a high-priced mutt, that more than likely isn’t recognized by the AKC. Some even tell buyers that these new “breeds” like yorkiepoos, buggles or jugs will be recognized by the AKC some day very soon. But people in the market for a new puppy need to realize that a cute name doesn’t turn a mongrel into a purebred. If you fall for the hype, you could pay more for a mutt than you would for a registered, guaranteed purebred. Ever heard of a Chusky? Yeah, me neither, not until I started doing research for this article. According to many sites, I own an expensive “designer dog”. My beautiful dog Zeppelin is a 100% purebred Chusky (sarcasm very much intended) and I got him for the low, low sale price of $0. Had his previous, abusive owners known that, they wouldn’t have surrendered him into my care at no cost! 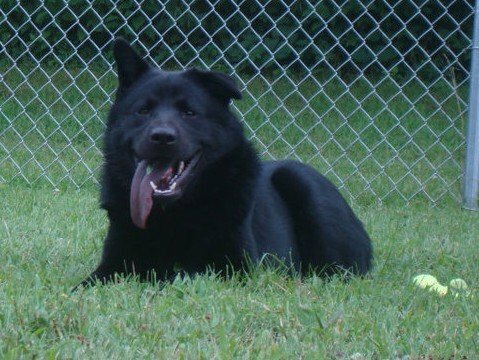 This beautiful Chow-Husky mix is absolutely one of a kind, and he is just that… One of a kind. Which is why most designer breeds haven’t been accepted by the AKC. When two purebred dogs are put together, you don’t always know what is going to come out the other end. You can’t know which traits it is going to get! It is like breeding two people. You can’t possibly know if it is going to get dad’s work ethic, or mom’s artistic abilities. Doodles are another hot, new breed — except they aren’t a breed, either. They are a mix of Poodles and Labradors or Golden Retrievers. Most doodles you see for sale are just first generation crosses of retriever to Poodle. They are mixed breeds! There is a puppy mill owner in Altoona, Iowa that will sell you a “GoldenDoodle” for $400, while the shelter down the road will adopt it to the right family for less than $100. Another fun fact: The “oodles” of Poodle mixes like yorkiepoos, pekapoos, schnoodles (and so on) have absolutely no breeding standards, no club, no standardized breeding records, and no plan for the future–which means no AKC acceptance letters for these doggies. So what is the point? Why go to a pet store and spend $1000 on a designer mutt, when you can go to your local shelter or www.petfinder.com and find something that is just as adorable, SO much cheaper, and that is going home with all (or most) of its vet work done? Here is my thought for the day… If rescues and shelters started putting these designer labels on their dogs, would they be adopted more quickly? I am really curious about what you think! How much is that doggie in the window?. Dyvig’s Pet Shoppe, Ames, Iowa… A store NOTORIOUS for selling Puppy Mill puppies. A few years ago my neighbor bought a “Pugalier” (Pug/Cavalier King Charles Spaniel) from, what I call, a backyard breeder. At the time I thought she’d done the wrong thing buying into the whole designer dog craze, but I was being polite and didn’t say anything, especially since I firmly believe in adopting! She told me she’d always loved Pugs but had been sold on “the fact” that crossing them would mean her puppy wouldn’t have the Pug problems and this was a “nice” breeder who kept all of her dogs in her home. During this sweet little dog’s life it has had surgery for: elongated soft palate and stenotic nares (Pug problems but can also be found in Cavs); surgery for a luxating patella (genetic in both breeds) and was found to have mitral valve disease (a killer found in 50% of Cavaliers) and finally passed away at age 4. Four years old and this little angel was taken from my friend. I am beyond angry at the people who would tell her this cross would be healthier. This poor dog inherited the WORST faults of BOTH breeds. There is little she can do to heal herself and the breeder continues to breed. Puppy Mill owners prey on the uneducated public and there is nothing we can do about it. I have a Goberian. He’s a pure mutt, Golden Retriever/Husky mix. He is the best dog, and came from a shelter. He may have been bred to be a designer dog, we’ll never know, but he is a great boy. I have a purebred Jack Russell. I adopted her from a rescue, I found her on Petfinder. She spent the first 6.5 years of life neglected on a back porch for being a dog and a jack at that. Her AKC papers didn’t get her anything. Thankfully she was surrendered around the time I was ready to adopt. I don’t have her “papers” because they don’t transfer and I could care less! Glad I found your blog! Keep up the great work! .